A group of University of Lynchburg students focused this semester on helping people live healthier at a local apartment complex. The students in the Master of Public Health program designed several workshop series to present at the Jefferson House, an apartment building that serves people over age 55. The students developed programs to help the residents learn ways to eat healthier, get exercise through simple activities, find enjoyable social activities, and save money. Susan Clapp ’15 MSN proposed the program after conducting research that indicated potential for a partnership, and it became a reality with the first class of MPH students. 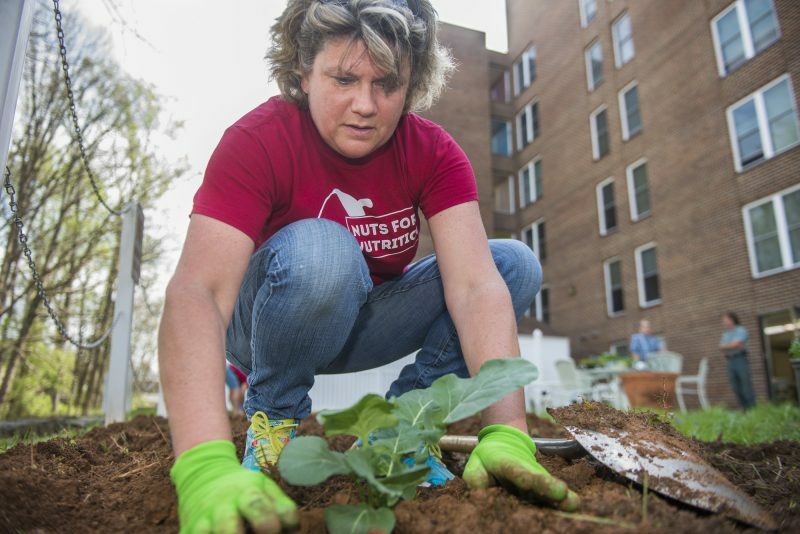 Kristi McIver ’15 helps plant a garden behind the Jefferson House. The nutrition-focused group shared simple recipes and taught classes about how to eat a balanced diet. Kristi McIver ’15 and J.P. Lopez ’14 collaborated to make cooking videos to teach healthy recipes. Eventually, an article about a proliferation of gardens struck a chord with Kristi. “I was looking for more economic ways for them to eat fresh organic fruits and vegetables,” she said. Then her eyes turned to a plot of grass beside a patio behind the apartments. A few weeks later, she and J.P. helped residents plant a garden there. Read the full News & Advance story here.